Step 1: Generating a shape for the prototype Our first design trial was based on experiences we did to increase the effect of a light similar to the light created by bioluminescence. We used for this the liquid found in glowing sticks: a mix of Phenyl oxalate and fluorescent dye solution that react when in contact with Hydrogen peroxide solution. Experience 1 Experience 2 Experience 3 In glass With water With mirror The presence of mirrors and water around the source of light increases its effect. We therefore decided to create a double recipient in Plexiglas, the inner part would contain the bacteria, and the outer part water surrounding the source of light, as well as mirrors on the back side as to increase its effect, the angular shape was based on an hexagon. 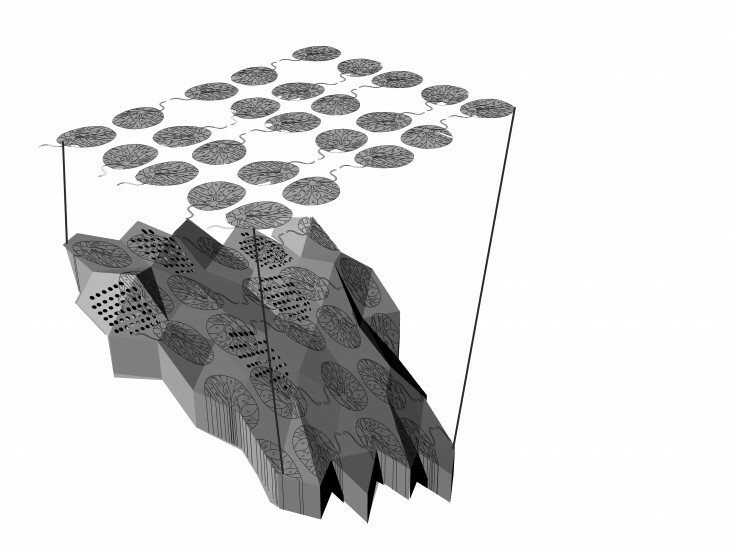 In order to implement the prototype in Valldaura, we took a cropped satellite image of the site and extracted a gradient image from it: The distribution of these hexagons represents the density of the trees it also corresponds to the way each prototype is placed on site. 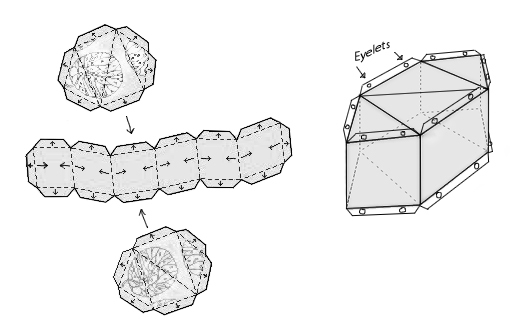 Problems related to this trial: We could not justify the choice of this shape for the volume, more than an intentional design decision; this choice was more based on the available icosahedron in the programs. The design did not take into account the different functional needs, necessary to maintain the bacteria alive and glowing: the nutrients, the conditions etc.. 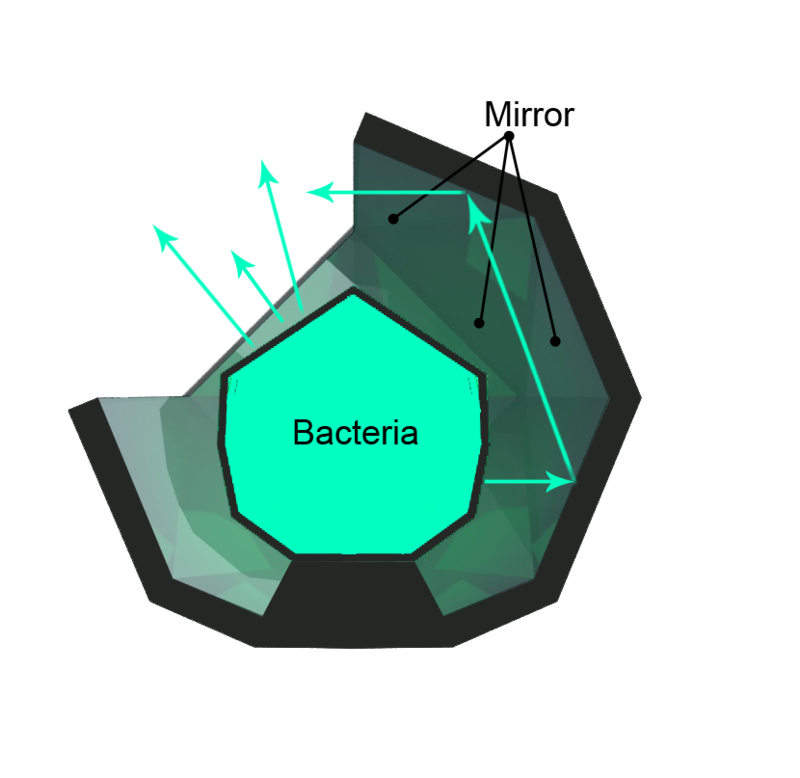 Step 2 Design of a system based on functional need In order to create a system that would maintain the bacteria alive, and ideally be self-sufficient, we studied in details the different needs necessary to maintain the bacteria alive and glowing. The functional needs The Vibrio Fischeri can live in both a gel agar or in liquid salty water. It also needs to get continuous input of nutrient, but also of oxygen, and in order for the oxygen to reach the bottom, the liquid or agar need to be stirred. We ideally would like to have some kind of interaction between the users and the bioluminescent installation. We still are researching to know if compost material resulting from the user food waste could be a good source of nutrient for the bacteria. 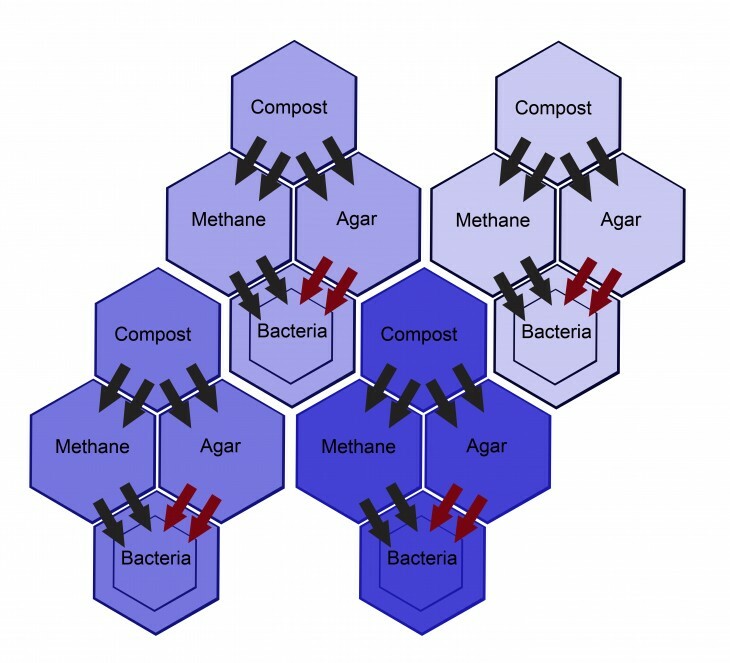 If this is the case, the methane generated by the compost can be directed into the agar or bacterial liquid, it will form bubbles that will provoke movements and will thus allow the oxygen to penetrate the bacterial environment. These different components, if put in different units, need to communicate: 1-Compost can be source of nutrients for the bacteria; the compost will be situated higher than the agar unit as to have the resulted juice continuously going down by gravity to fill the agar unit. 2- The agar unit is then connected to the bacteria unit and linked to inner skin through pipes which opening can be controlled from outside. 3- The methane unit is also connected to inner bacteria unit through continuously opened pipes. When methane enters the bacterial liquid it transforms into bubbles that agitate the liquid and thus allow regeneration of oxygen and agar inside the bacterial liquid. 4- The bacteria unit is double skinned as to give some temperature insulation to the bacterial liquid which is contained in an opaque recipient. Holes in this skin allow the oxygen to enter the recipient and fiber optics to go out of it and transmit the light. These different connections require a shape that can be tessellated. The following diagram shows how each 4 functional units form one whole unit, and how those units tessellate: At a theory level, the organization and function of this system are successful and present a credible draft for a more high tech installation. Future development concerning the functions: However, in order to achieve a fully self-sufficient system the units would need to improve as following: 1-Compost would need to be under UV light in order to be sterilized and not contaminate the vibrio Fischeri culture. 2- The agar unit would have to be linked to measuring tools in order to control the needed quantity and balance of the ingredients and extract the extra quantity of ingredients 3- The methane if directly introduced into the bacterial liquid will displace the oxygen which is not ideal for the bacteria which is aerobic and needs oxygen to live. Rather, the methane can be burned in this unit and serve as energy supply to power an air bubbler that would be connected to the bacterial unit. 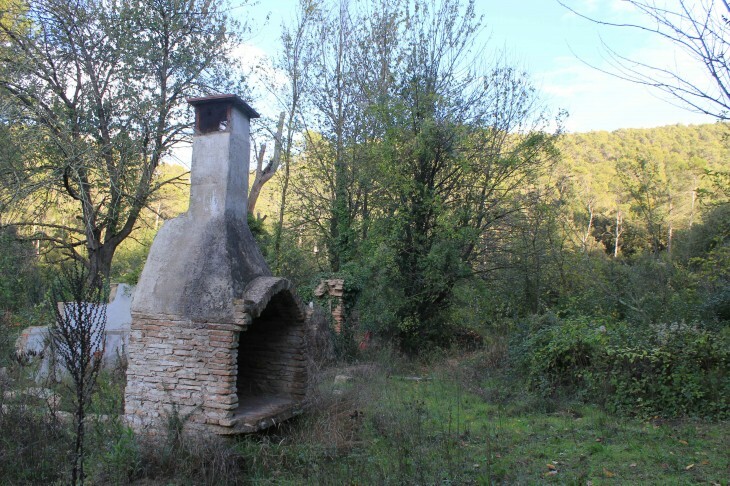 Implementation on site and shape design We were inspired by the ruins site in Valldaura The evanescence quality of bioluminescence seemed to connect with the feeling of nostalgia that such a site can provoke. The parallelism between old and solid stones scattered all around and a lighter installation was also inspirational to us. This site also represents a potential public area where people could picnic and spend some time. It is an opportunity to establish an interaction between the users and the installation. The users would throw their waste in the compost unit, which will feed the bacteria that in return could be maintained alive and glow. The revival of that place and the life of the bacteria become intertwined. 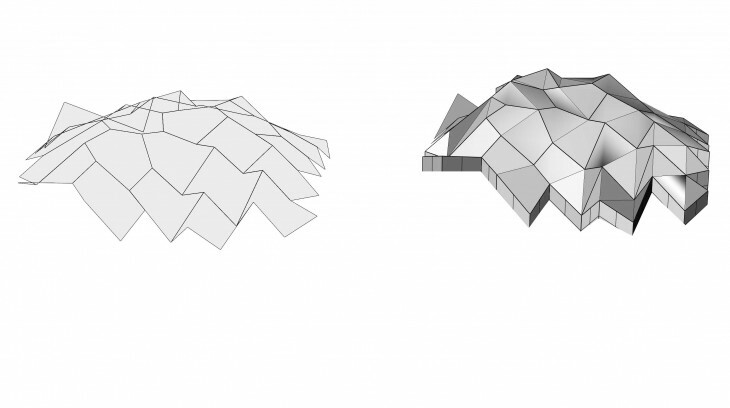 In order to anchor the installation on the site, we used the 123d catch autodesk program to construct the mesh of an existing surface constituted of stones and vegetation. From this mesh we extracted a surface on which we applied a hexagonal grid, and created our installation by applying a grasshopper definition that transforms this grid into volumes. From these volumes we extracted one unit and applied on it contour lines in order to fabricate it with the laser cut. The problems we encountered with this prototype are the following: -The scale was too big for one unit and seemed bulky – The design of this unit did not help in the development of connections with the neighboring units – The material (Plexiglas) was too expensive Step 3 Reducing the hexagonal grid The second trial in the design development consisted of reducing the size of the grid, to obtain smaller units. Also, instead of using the contour function for the fabrication of the unit, we rather unfold it for the laser cut. The problems that arose from this method are the following: -The material (Plexiglas) and method of fabrication were incompatible; we could not fold the plexiglas without breaking it, it was also impossible to make the unit waterproof. -The connections between the different units were still not easy to figure out Step 4 Changing the material and fixing the connection We changed the material from plexiglas to polypropylene. After some research, we confirmed that his material is compatible with both the methane and the compost. This material turned out to be much more compatible with the folding method of assemblage. We extracted 4 units from the whole installation to start with: We separated the sides, bottom, and top in rhino and added a tabbing to the different sides through a grasshopper definition. These tabbings allowed us to assemble each unit and the different units with one another. We did that using punch pliers and eyelets. We still need to try closing the compost units with magnets, to be able to open, and have it well sealed when closed. The holes in the bacteria unit, that allow the oxygen to enter the bacterial liquid and the optic fibers to stick to the outside, follow the patterns that represent a bio-luminescent cell. Our intention by choosing these patterns is to give a hint on the nature of bioluminescence by revealing what could not be seen but through a microscope. We projected the patterns on the whole installation prior to the unfolding of the different units. We would like to thank Dr. Silvia Bures for the help she provided us with, and her contact Dr. Peters for his time and information and Luis Fraguada for his availability.